Illustrator CS5 offers a new, simplified way to select an object that is behind, or underneath, another object. Just hold down command (Mac) or ctrl (Windows) and click repeatedly on the top object until the object behind is selected. This is a nice addition to Illustrator CS5 because InDesign has had this feature for many years. Along with this new feature comes a new preference setting that could trip you up someday. 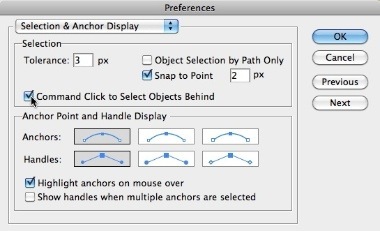 Preferences > Selection and Anchor Display has an option to disable this shortcut. So, if you want to be able to use this, be sure that "Command Click to Select Objects Behind" is selected.